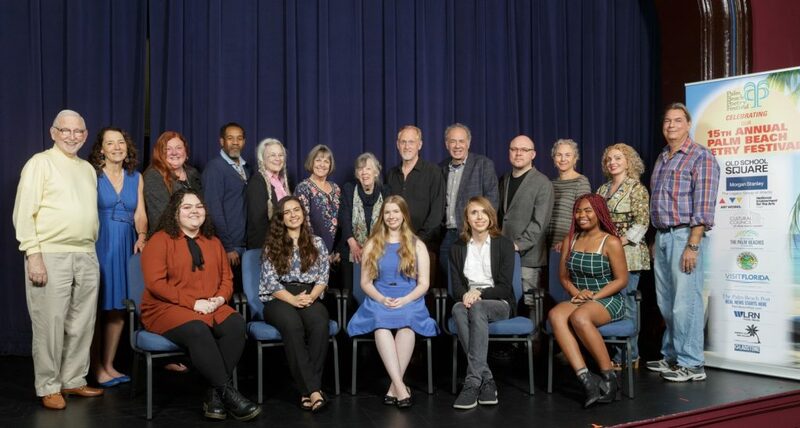 Winners of the High School Poetry Contest were celebrated at the Annual Palm Beach County High School Poetry Contest Award Ceremony, in the Crest Theatre, at Old School Square in Delray Beach, January 20th. Open to Palm Beach County public and private high school students, five winners were selected from over 300 entries by Dr. Jeff Morgan, Lynn University, contest judge. In addition to cash prizes, all winners received a pair of tickets to “A Special Evening of Poetry with Tyehimba Jess, winner of the 2017 Pulitzer Prize in Poetry for his masterwork, Olio. Jess visited Palm Beach County High Schools presenting Olio and reading performances followed by Q&A sessions with students during festival week. It is estimated that these programs reached over 3,000 students. Winners will also receive subscriptions to Poets & Writers Magazine. Select this link to read the the winning poems. “The Poetry Festival has been honored to work with high school teachers throughout Palm Beach County for the past 14 years. We have visited hundreds of classrooms to discuss the craft of poetry and encourage students to write original poems, and every year we are amazed by the quality of their submitted work. In fact, many of our past winners have gone to college to become teachers themselves, and we are always hopeful that the Festival is nurturing a future Poet Laureate of the United States,” she adds.